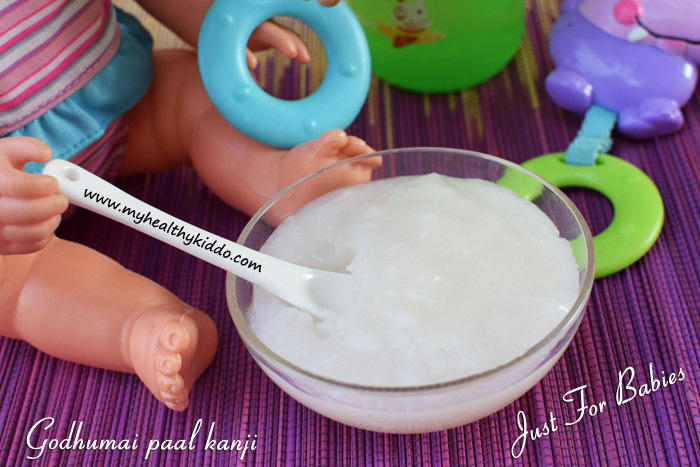 Though there are many varieties of ready-made baby foods available in the market, none can compete the satisfaction factor rendered by home-made ones. One such fresh and healthy porridge is Godumai paal kanji.. 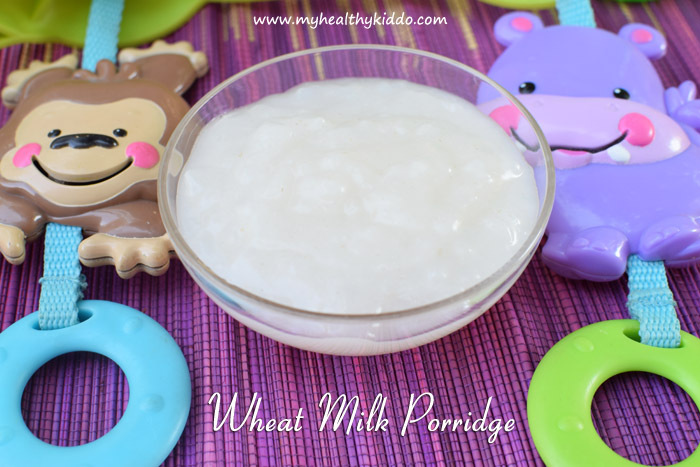 Wheat Milk porridge is a wise choice in introducing wheat to your baby. Try this light-version for a month before trying whole wheat foods. Always start with small portions and check if it suits your baby. 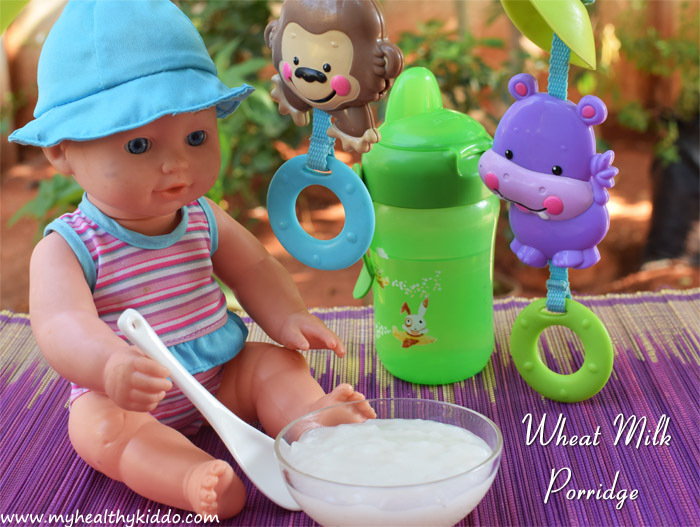 Watch for wheat allergies in babies and immediately report to doctor, if you see any. Do introduce Finger Millet(Ragi) Milk Porridge before introducing this. 1.Wash wheat kernels twice or thrice in water and soak it overnight. 2.In the morning, it bulges and becomes soft. Just drain the water and add the soaked kernels to a mixie jar. 3.Grind to a smooth paste. Add half cup of water and grind again. 4.Filter the ground stuff to squeeze out the wheat milk(Pls see Notes section). 5.Pour extracted wheat milk in a pan and cook simmer. 6.Keep stirring continuously. Once cooked and starts to shine, add lil ghee and switch off the flame. Top with breast milk/formula milk or just feed as such.. Though Punjabi wheat can be used, I recommend Sambha wheat as it is more nutritious. This porridge thickens quickly. So, feed immediately. Do not add sweet or salt in food for baby below 1 year. I use sieve(Milk/Tea filter) to filter wheat milk when I prepared for my baby. For this shoot, I used a muslin cloth as I have packed my sieves for US trip. After the shoot, I realized that wheat milk should not be squeezed using cotton cloth as it sticks heavily and doesn’t leave the fabric even after rigorous washes! So, please use normal filter and press with a spoon to extract the milk. If using cloth, do not squeeze much. @Janani, As I have mentioned in the ingredients box, it suits 8+ months babies..